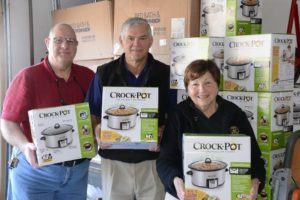 (l to r) Northborough Rotary Club members Chuck Frankian, Phil Lockwood and Patricia “Pat” Doyle with the new crockpots. Northborough – In February 2016, the Northborough Food Pantry provided 362 bags of groceries to families and individuals in the community – 73 percent more than what it distributed during the same month in 2007. Although many aren’t aware of it, the need for food assistance has been growing. The Northborough Rotary Club is aware of that need and it’s been doing what it can to help its neighbors. In May, it donated 70 crockpots and meat vouchers to people served at the food pantry. 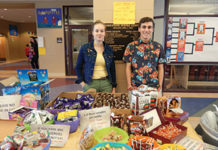 Helped by a matching Rotary Foundation grant and a discount from Bed, Bath and Beyond, the club’s project originated after a brainstorming session the members had at the food pantry. 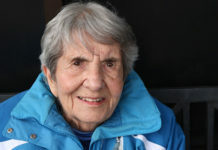 Patricia Doyle, the outgoing club president and newly elected Rotary district co-governor (along with her husband, Skip), recalled that when she asked what the club could do to help, a donation of meat vouchers was suggested. But she knew they could do more. When thinking about how the recipients could cook the meat, she remembered thinking “Why not a crockpot?” Since they would allow busy families to cook healthy, hearty meals, the food pantry embraced the idea. “It was a very good working relationship we had with the food pantry,” Doyle said. 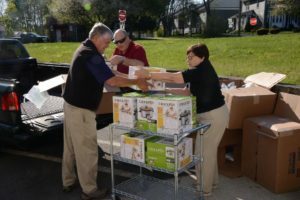 After deciding to buy new crockpots and meat vouchers for 70 food pantry clients who could benefit from them, the club expanded the project. They wanted to be sure the recipients had healthy, easy recipes with ingredients available at the food pantry. With that in mind, the club began creating a cookbook of slow-cooker recipes. While the cookbook will be finalized and given out in coming months, a couple of the recipes were passed out with the crockpots. Not only has the project inspired another local Rotary chapter to consider a similar project, it has given people a chance to make a sustainable difference in their lives. The food pantry is grateful. And the Rotary Club, which fought hunger last year by participating in an End Hunger New England nutritious meal-packaging event, is also thrilled to have helped its neighbors again this year. To learn more about the Northborough Rotary Club, visit www.northboroughrotary.org. 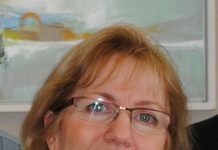 To learn more about the Northborough Food Pantry, visit www.nfpantry.org. Food donations can be left outside the nonprofit’s entrance at 37 Pierce St.